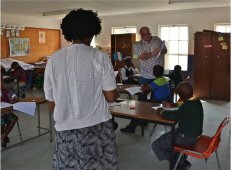 Children in Tyume Valley speak Xhosa as their first language; they begin learning English in primary school. Fluent English is essential to both educational achievement and future employment opportunities. 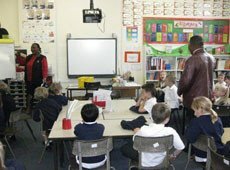 However, South African teaching is often formal and traditional; children lack comprehension and confidence in speaking English. Poor English also hampers progress in IT if children cannot understand instructions or master basic keyboard skills. In 2018, we piloted an integrated, project-based programme that addresses both English and IT deficits. TVS’ TechLearn programme uses IT technology to support children’s English language learning and introduce children to computers as a learning tool. 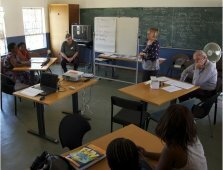 Training for local teachers is an integral part of the programme. The one-year programme is divided into three modules. Each module lasts 5-8 sessions and is supported by detailed lesson plans and learner workbooks. For details of TechLearn, click here. During 2018, 114 Grade 6 children from seven primary schools took part. Children were divided into groups of 15 – 20, each taught by a team of two teachers. Teaching takes place after school; TVS pays for transport to its IT lab and a nourishing afternoon snack. Seven teachers from Tyume schools and/or communities and TVS’ two IT trainers piloted TechLearn. 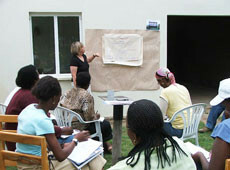 Each module was preceded by a two-day teacher training workshop. TVS pays stipends to the participating teachers for this extra-curricular work. As a pilot project, the 2018 Techlearn programme was evaluated in depth; following some changes, the programme is being repeated during 2019.